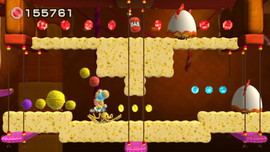 Miss Cluck the Insincere's Castle is the eighth level of World 3 in Yoshi's Woolly World. The level starts with many Woollet Bills, along with a few Shy Guys and Item Balloons. After a while, there is a vertical segment with many Woollet Bills, and then a horizontal segment with even more Woollet Bills, followed by the first checkpoint and a door. Peeplys then appear, followed by many Miss Clucks. After a while, sponge dirt appears, along with even more Miss Clucks. A while after that, the second checkpoint appears, followed by another door. The final segment consists of traveling across Woollet Bill trails once more, with more Item Balloons and a few Shy Guys and Miss Clucks added. The final stretch leads directly to the boss door. Smiley Flower 1: In plain sight, just between two Shy Guys on Item Balloons. Smiley Flower 2: In a Present Box to the left of the door entrance after the first checkpoint. Smiley Flower 3: Not long after the third Wonder Wool, there are some breakable blocks that are blocked from view by Miss Clucks in the foreground. Yoshi must simply ground pound the blocks and make his way to the Smiley Flower. Smiley Flower 4: When Yoshi approaches a Miss Cluck stuck in the sponge dirt, he must throw a yarn ball at it, and then climb up the path that the Miss Cluck was standing at to find the Smiley Flower. Smiley Flower 5: Not long after the fourth Smiley Flower, inside an edible wall. Wonder Wool 1: Atop the platforms above the first Item Balloons. To obtain it, Yoshi must ride the parallel Woollet Bills to the platforms. Wonder Wool 2: Just above the first Miss Cluck, although Yoshi must jump on it in order to get it. Wonder Wool 3: In an alcove below a set of stairs. To get it, Yoshi must lure the Miss Cluck guarding it into the bottomless pit over to the right, then go for the Wonder Wool. Wonder Wool 4: Not long after the fifth Smiley Flower, the Wonder Wool can be seen above, past some sponge dirt and guarded by a Miss Cluck. To get it, Yoshi must throw a yarn ball at the sponge dirt to make the Miss Cluck fall, then jump on it to reach the Wonder Wool. Wonder Wool 5: In the alcove guarded by the last Miss Cluck before the boss door. 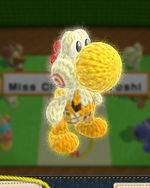 Collecting all of the Wonder Wools knits Miss Cluck the Yoshi back together. This page was last edited on March 23, 2019, at 10:23.